Snarling dragons. Roaring tigers. Goblins brandishing clubs. These are some of the subjects of Japanese artist Yasunori Kimata’s brush painting pieces. On November 5 from 10:30 a.m. to 11:30 a.m., UCF students can see Kimata’s artistic process unfold live with a free brush painting performance in the Cape Florida ballroom of the Student Union. 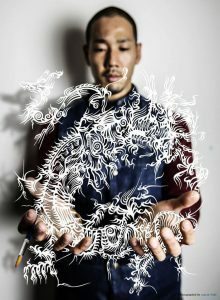 Kimata has performed live brush painting both solo and collaboratively in Japan and abroad. There will be an introductory discussion and Q&A session with Kimata precluding the performance. Through these events organized by the Department of Modern Languages & Literatures, students learn about Japanese culture through their art. Last November, the Japanese program presented a Japanese Tsugaru Shamisen performance by Kyle Abbott and Mike Penny, two world-renowned players of the shamisen, or three-stringed Japanese instrument. “As a person with a huge passion of Japanese culture, I really appreciate these types of events where I can enjoy the experience while retaining the same level of cultural significance, even if it’s happening miles away from its home country,” said Anne Tran, another student attendee. For now, students can experience mesmerizing Japanese art on November 5. Seating is limited. RSVP to the event here.